I can't believe July is here already. I'm excited for the long holiday weekend! My bother's grad party is tomorrow, Sunday we have church and a cook out to go to, and no plans yet for Monday. What are you up to this weekend?? Today I have another festive look for you all. This LOFT Halter Midi Dress was an awesome find and a steal of a deal! It's marked down to $34.88 and an extra 50% off with code JULY4TH ($17.50!). All sizes are available in regular and a few in petite. I don't own any other midi length dresses but the style is trending right now so I thought I would give it a try. I honestly love this dress! The strappy halter neckline is flattering and the length gives it a fun boho vibe. This dress is perfect for summertime and can be dressed up or down. For jewelry, I went with antique gold. I think red and gold are stunning together! I love how my Trading Hope Ophelia Necklace looks with the dress. This brass necklace is beautiful and handcrafted in India. It's $32 and makes a great gift, too! My BP. Straw Fedora Hat has been on repeat all summer. It just seems to go with everything! I think it's adorable with this dress. It's $18 with free shipping. If you're looking for a summer straw hat, give this one a try! I'm really happy with it and obviously wear it a lot! Ha. Here's a better look at the Trading Hope necklace and matching earrings. It's a gorgeous set! For shoes, I went with my Sam Edelman Reid Platform Sandals (in almond patent). I think a little height looks best with a midi length dress. I wanted to keep the look casual and whimsical though, and these slip on wedges are perfect. They are available on Amazon in several colors. I highly recommend them! SUPER comfy. Here's a look at the back of the dress. I love the keyhole and ties at the neck. It adds a pretty and feminine touch to the dress! Psalm 150:6, Let everything that has breath praise the Lord! Awww Tamara, you always find the prettiest pieces at Loft and inspire me to buy them too. Love that dress and your matching jewelry set. Subtle and chic way to style for this 4th of July weekend. Congratulations to your brother! I love your midi dress! 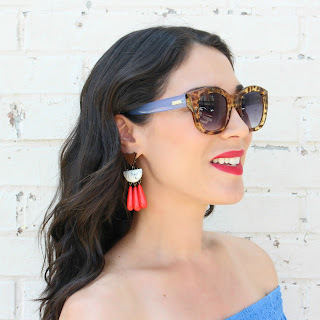 Your look is so sophisticated and a excellent take on 4th of July fashion! I absolutely love everything about this dress! The midi length is super flattering. The color and pattern are perfect and will transition perfectly into fall. The halter top is super cute. Really great look! Such a cute midi dress! Love it.